do you think i would leave you empty handed today? for that is not my way. it will be a little bit of waffle and then i will leave it up to you to decode my waffle and make it up as you go along. and i do not have 'step by step' pics because Carlos my camera is feeling a little peaky too. step 2: double crochet into same chain, repeat two more times. step 3: single crochet into third chain from your cluster of double crochets. a shell has been made, next shell will be made up of 5 double crochets, this is the basic shell pattern that can be found in any crocheting how to book. step 4: repeat all along your chain to end. you should have 13 shells. step 5: turn your work but keeping the same side facing you and repeat the same row you just did, but along the bottom side of the chain. a mirror image of what you have just done. step 6: finish off your final shell by slip stitching into the very first shell you made. basically you have gone around in a circle. you first side is complete, 13 full round shells should be in your hand. i chose to do this because i liked the wrong side of my crocheting best, you can chose to use the other side if you wish. with a contrasting yarn color, begin the right end of your happy coat, making sure the stitches are lined up and start single crocheting them together. i went though both loops of the stitch below. step 10: when you get to the left end of you happy coat, pop your hanger in place, then continue to single crochet around the bottom of your happy hanger coat. step 11: when you get all the way around your happy hanger, finish off and weave in your last thread. make sure any passing strangers who come into your dwelling notice your happy hanger, taking time to admire your happy hanger handy work and perhaps cast an envious eye upon your happy hanger and your Mr Hook. footynote: any misprints or misleading crocheting things found within this 'how-to' are the responsiblity of Mr Lurgy and not Tif. Sorry to hear you are still suffering with Mr Lurgy - he really is a clingy fellow, isn't he? Hoping you are free of his over-attentiveness very soon indeed. oh wow! 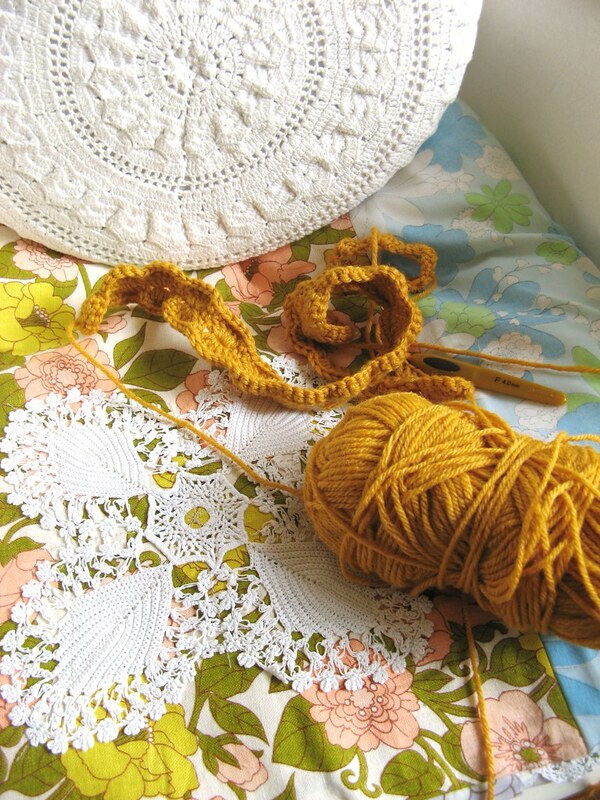 you are so sweet :) i just found a comprehensive book at the library all about crochet borders. i can't wait to truss up some skirts and the like. hooray happy hangers! oooh, thank you, tif! mr. lurgy has been parked in my home for the past two and a half weeks, and my eyes are starting to cross from working on my giant (more giant than i had anticipated. hmm...) afghan. some pretty hangers will be a pretty distraction from feeling like absolute crap. hope you are soon on the mend! Curses be upon Mr. Lurgy, I hope he fades away soon! Lovely crocheting how-to - I must learn to crochet one day, for then such posts will not look like latin to me. I was just looking at your hangers the other day and thinking I'd sure like some just like yours. Oh my, were you getting my vibe or what!!!! How fabulous! 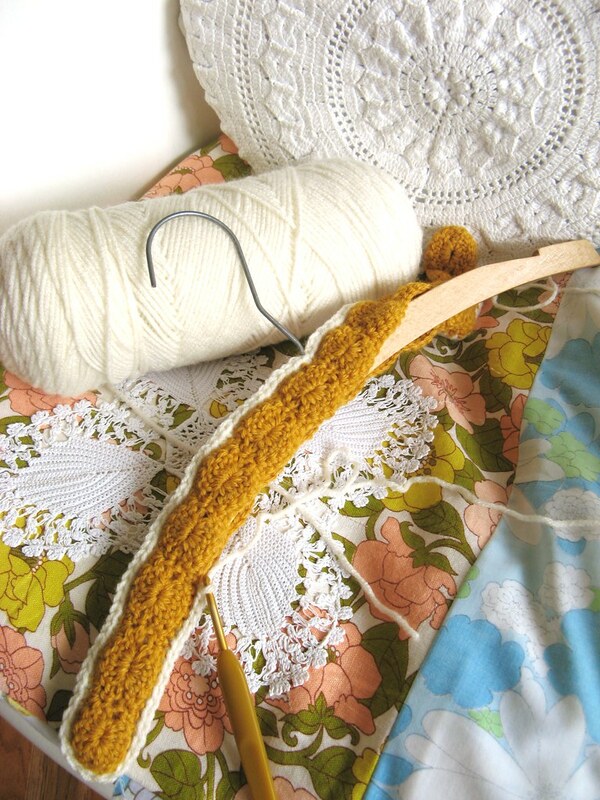 I want to make lots of lovely hooky hangers now! Hope Mr Lurgy leaves you soon. Where did you get that reindeer hook thingy and what is the name of that wonderful corally pink paint that you are using on stuff? I struggle to get paint here on our little islandy place and probably need to order some. P.S. Your entire blog is adorable- colorful, handmade, vintage-looking FUN stuff that I love. Really cute! Dear Tif...You have actually made my day!!! I have said wooden hangers in cupboard and I know that me "crochet roundie, maker of all things grandma" have not been able to crochet a cover for one yet...I know you are shaking your head in disbelief but it is the sad true truth. a peachy perfect tutorial miss Tif, despite Mr Lurgys attempts at thwarting your efforts! This is a huge inspiration for me, and to know it's so easy to do! Thank you....so much...I love them.. Thank you for sharing this great idea. Enjoy your weekend. Apart from the fact that the lurgy is here already, it's not affecting my ability to read thank goodness so I can keep up with you whilst my hottie is keeping me warm. I must say I rather like these covers but they must go to the end of my project list - still struggling with the Art of Crochet I'm afraid. Thanks for teh tutorial! I will definitely clothe some of my old hanger this way. Those hangers are so sweet! I'm a beginning crocheter and am not ready to tackle them yet but sooner or later I'll be festooning my closet with happy hangers. Thanks for the tutorial! I do hope that Mr Lungy leaves you soon, he can often overstay his welcome! Your happy hangers are beautiful and for the moment I'll just have to have admire them, I have no idea how to creat such delights from a piece of yarn and a hook. thank you for that! i may try it out, one day soon. and thank you for your blog. Hope you're feeling better. I haven't visited for a little while, so I had a little catching up to do. You showed admirable restraint with the Liberty business. Congratulations! If it's any consolation, we don't have target. Just remember, it will still be there, next September! I love your book case curtain and the hangers. They are both beautifully unique as usual. Far superior, in my opinion, to anything new on the market. Also I love, no... more than love, your crochet ripple. Will we get another glimpse of it again? Take care, and get better! Hi, I stumbled onto your blog last week and I just want to say that you inspired me so much! I love everything you make. I've put a link to your blog on my blog today. So glad I found your blog! I wonder if a bike can be decoupaged....? If I can find an old coat hanger I will certainly have a go! just found your blog and I will have to say that this tutorial is AWESOME!! Making hangers pretty will be on the top of my list. Thank you so much! Hola, you are the sweetest and funny happy girl, and I have laugh (or laufh) a lot, excuse my english. Thanks for the inspiration. 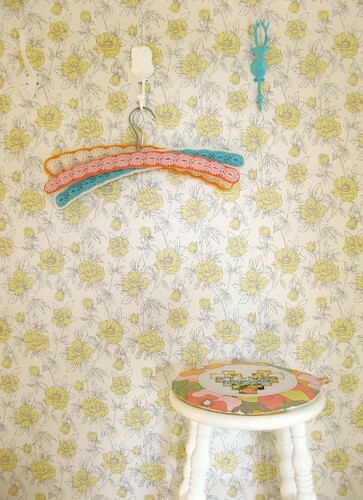 I made myself a happy hanger :-) and placed it on my blog. I linked to your blog for instructions. 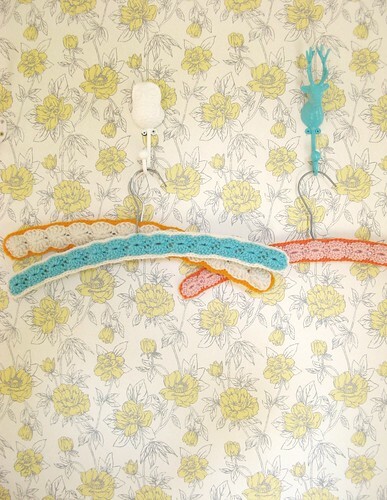 Thank you kindly for the instructions on how to make these lovely hangers! I have been searching them out for years at second hand stores and garage sales, snatching them up whenever I find them. I USE them, they are wonderful, and now, thanks to you, I can create my very own (of course using the innumerable skeins of vintage yarns I have been saving). I am delighted to find your blog! I have my sister Kelly from SECOND HAND CHIC in Salt Lake City to thank for this. She, like you, is a very crafty woman, and has a wonderful store that serves the greater Salt Lake City area: people can't get enough of her finds and are always amazed at how she creatively re-uses items. Again, thank you for the lovely and inspirational site. I think I will be visiting you frequently in cyberspace. I just found your blog and am very excited about what I see! I love the great instuctions on the hangers and can't wait to make some. BIG THANKS! I just want to say thank you for such a fun project. I have been waiting to make some of your hanger covers for months and finally, my friend came through with some old hangers. I made two last night and they are adorable. Please, please let us know where you got that lovely wallpaper! And thank you so much for your tutorial. It makes me want to learn to crochet. as for the wallpaper cathryn, it is by graham & brown, part of their eco collection, comes in various soft colors, the one here is yellow. May I ask you what technique you use to crochet into that first chain? Do you put in you hook under one or two loops? I chose the 'easy' way and took one loop, but in the end my crochet work was much more 'open' than yours. It could also be due to the fact that the hanger is probably a little bit wider than yours, but I was wondering whether the way you make that second row makes much of a difference. I'm not sure whether my question from yesterday came through but I'll ask it again: could it be that there is an error in the nummer of chain stitches you start with? I couldn't make 13 shells out of 65 (+3) chain stitches. If each shell consists of 6 stitches, I think it should be a chain of 75 (3) stitches? Love the pattern, by the way!!! Thank you so much for sharing it! first off, yes i put my crochet hook into two loops to make a tighter weave between the rows! I just found your tutorial from grosgrain and I'm so happy I did! 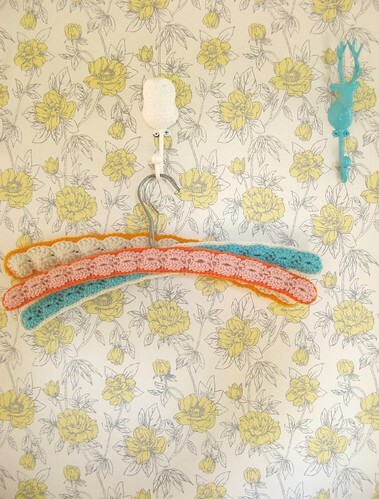 My dear grandma used to crochet hangers like yours - she's been gone for many years but I still have some of the hangers and I treasure them. Thank your for the lovely memory - and I will make some of my own now. This is great. We have some hangers my grandmother made and wanted to duplicate them ~ this is the stitch on the hangers! Thanks! That's lovely, i'm going to make some this weekend.